This abstract was presented today at the Association for Research in Vision and Opthalmology (ARVO) meetings in Seattle, Washington by Corinne N. Beier, Bryan W. Jones, Philip Huie, Yannis M. Paulus, Daniel Lavinsky, Loh-Shan B. Leung, Hiroyuki Nomoto, Robert E. Marc, Daniel V. Palanker, and Alexander Sher. Purpose: In the rabbit retina there is evidence of constructive retinal plasticity in response to focal ablation of a small patch of the photoreceptor layer by laser photocoagulation. After a two-month healing period, healthy photoreceptors migrate inwards filling the damaged area and restoring visual sensitivity to the lesion site. We investigated the integrity and function of the neural populations above the lesion, whether the migrating photoreceptors formed new connections with deafferented bipolar cells, and to what degree the new function resembled normal retinal function. Methods: Retinal photocoagulation lesions of Moderate and Barely Visible clinical grades were produced in rabbits with a 532-nm laser, using beam diameter of 200 and 400 μm. Retinal ganglion cell (RGC) responses to spatio-temporal white noise stimulus were recorded on a 512-electrode array. 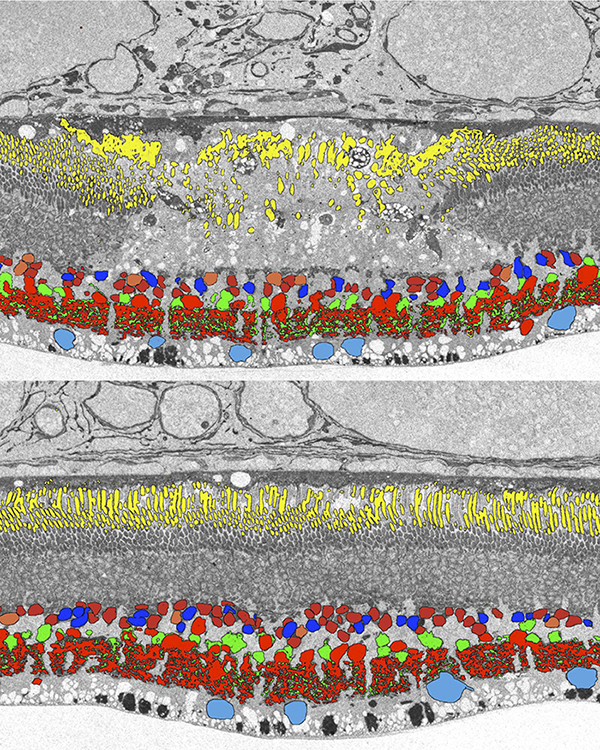 Inner retinal neuron cell types were identified using Computational Molecular Phenotyping (CMP). Light evoked activity of the inner retinal neurons was measured through 1-amino-4-guanidobutane (AGB) labeling. Synaptic structure between photoreceptors and bipolar cells was characterized through transmission electron microscopy (TEM) imaging. Results: The lesioned areas of the retina, after a two-month healing period, regained visual sensitivity. There was no significant difference between the response kinetics of RGCs with receptive fields covering the lesioned area and RGCs with receptive fields unaffected by the lesion. Furthermore, the average receptive field sizes of RGCs covering the lesion were consistent with the average receptive field sizes of RGCs unaffected by the lesion. CMP showed that all major inner retinal neuron cell types are present above both acute and healed lesions. Light evoked activity in the retina, as measured by AGB concentration levels, was diminished in the acute lesion but returned to within 10% of normal after two months. TEM images showed normal photoreceptor synaptic structure inside the healed lesion area. Conclusions: Migrating photoreceptors establish new functional connectivity to deafferented bipolar cells and have normal synaptic structure. The new circuitry results in spatial and temporal properties of the RGC responses that resemble those of the healthy retina. In summary, the rewiring restores normal visual response in the lesioned area, indicating constructive retinal plasticity.